I think the first time I ever baked with fleur de sel was when I made Dorie Greenspan’s World Peace Cookies, and I was immediately hooked. 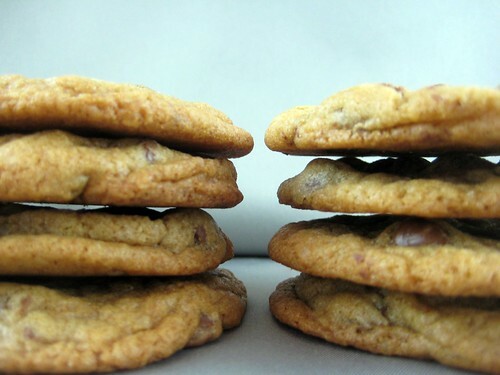 Since then, I’ve made a slew of other salty-sweet recipes, including the super popular NY Times chocolate chip cookie recipe. Then David Lebovitz‘s salted butter chocolate chip cookie recipe showed up in my Google Reader, and I knew it had to be made. David’s recipe uses ingredients you already have on hand–no need for special flour or gigantic chocolate pieces–and since the fleur de sel is mixed in rather than sprinkled on top, you get little bites with a salty crunch. Mmmm! If you’re a fan of fleur de sel in sweets, this is a must-make recipe! In the bowl of a stand mixer, or by hand, beat the butter, brown sugar, and granulated sugar just until smooth and creamy. Stir the flour mixture into the beaten butter until combined, then mix in the chopped chocolate (including any chocolate dust) and the chopped nuts. To bake the cookies, preheat the oven to 350ºF (180ºC). Line two baking sheets with parchment paper or silicone baking mats. Form the cookie dough into rounds about the size of a large unshelled walnut. Place the mounds evenly spaced apart on the baking sheets, and press down the tops to flatten them so they are no longer domed and the dough is even. Bake the cookies for ten minutes, rotating the baking sheet midway during baking, until the cookies look about set, but are not browned. I’ve been saving my fleur de sel, wondering what to splurge it on. these sound great! I really love David Lebovitz’s recipes. I made the candied bacon ice cream for friends last month (and a lot of recipes from the Perfect Scoop). I really should add him to my delicious! Can I possibly express how much I love these cookies? Maybe after I’m finished eating. I always like that his recipes are small so you don’t have tons of cookies laying around. I love the flake salt in cookies, just made some via another recipe last night and I’m enjoying one as I read this. Yeah… this sounds pretty amazing! Can’t wait to get these babies cooking! Can’t wait to try these! I <3 salt and butter! oh wow these look delicious! who can resist a chocolate chip cookie? how did this compare to the NYT one? better? YUM! I finally got around to making these and they are fantastic!